Ausroad Systems Pty Ltd is an Australian-based company that manufactures, distributes and hires road maintenance equipment to both the domestic and Indonesian market. The business is known as one of the leaders in providing economical road maintenance solutions to Local Government, Contractors and Private Companies who maintain sealed roads across the country. The company was founded in 1989, and in the mid-2000s the name was changed to Ausroad to reflect a shift from general equipment loans and production to road work in particular. Following the name change, they also started customising and creating their own products to better meet the needs of the industry. Since then, the company has been steadily building their reputation as a leader in their niche. They have recently created two new Stemming Trucks available for hire for the mining industry, but the design and creation of road maintenance equipment continues to be their top priority. Ausroad’s goal is to provide the most efficient and most advanced road maintenance machines worldwide. In service of that goal, the company is committed to developing new technologies, and they are backed by a wealth of experience and knowledge that enables them to do that. 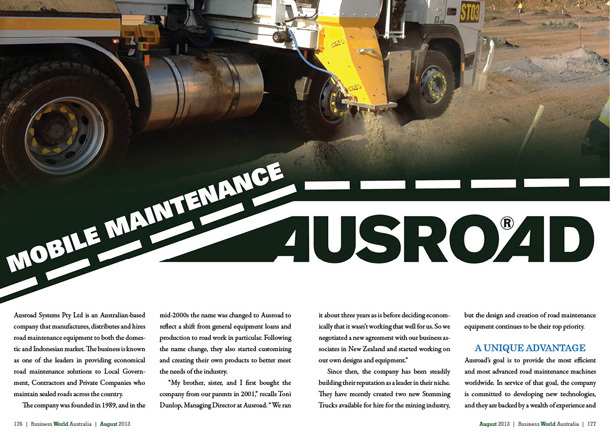 One example of the company’s unique offering is the Ausroad HD series road maintenance machine, which is capable of handling both hot mix and aggregate, and is suitable for pothole patching (large & small), heavy maintenance, patch compaction and general maintenance repairs. Another, more popular example, is the Ausroad Jetmaster road maintenance unit, which provides faster, longer lasting repairs to pot holes, road depressions, edge breaks, wheel path rutting, crack sealing, digouts, speed bumps, drainage bumps, scabbing, and other roadwork damages. They are capable of a 2.4 metre-wide, single pass emulsion spray sealing and depression filling – something which few other systems on the market can boast. Additionally, there are a number of other advantages to the “Jetpatching process,” as the company calls it. These advantages include the utilisation of low cost materials such as aggregate, emulsion, and sand, lower maintenance costs, and reduced labour costs. The Jetmaster also has the ability to blow all water and debris out of holes, is the only blower type unit that has the ability to use variable speeds for emultion, and can use varying sizes of aggregate to boot. It even possesses a unique, pressurized kero tank cleaning for the system nozzle. All of this, of course, results in an overall much higher production rate than competitors can possibly boast. 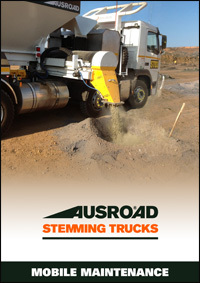 The Ausroad system for aggregate delivery also utilizes the Venturi system. In the entire world, the Ausroad Jetmaster is the only road repair machine using this “powerful and advantageous system,” Toni says. The unique swivel venturi distributor is what enables the Ausroad Jetmaster to provide even higher production rates without excessive wear to the delivery system. In particular, there are several main benefits to the use of the venturi system, which put the Ausroad Jetmaster well above its competitors. For example, the venturi distributor eliminates the costly time and maintenance required by the superseded rotor distributing system first developed by Ausroad prior to its incorporation. This amazing system also utilises absolutely no moving parts, and does not require down time for cleaning, fitting and adjusting wear pads or ‘O’ rings. This further also saves on the continuous costs of new wear pads, ‘O’ rings, and the time and maintenance of regrinding, replacing, and re-fitting the rotor. Furthermore, the venturi system will, in fact, handle any material that flows up to 12 mm – even including fine particles such sand, which can be applied to the road repair using a delivery hose controlled by the operator. The system’s unique composition also allows for the simplest forms of cleaning; only needing water to be run through it while running. This means no dismantling at the day’s end, and no oiling for the Jetmaster. At that size, Toni says the business will be big enough to satisfy the needs of their customers, but still small enough for them to provide personalized and attentive service. That’s where they want to be.